Who doesn’t enjoy music and movies in this world? And if the music or movie is running on the best audio devices that would be like icing on the cake. The best Home theater systems are designed only for the music lover and movies lover. They give a crisp and clear sound, great bass and a theater-like experience in the home. And in my opinion, one should never compromise on the quality when it comes to home entertainment systems. Let’s know more about the best surround sound system or best home theater systems. A home theater system is a combination of an audio and video electronic components set up in your home to recreate the experience of watching a movie in a theater or making your own place a DJ Party Hub. With this surround sound system, you can hear music, sound effects, and dialogue from all around you, not just from TV. For buying a home theater you have to check for every feature from audio techniques to connectivities, from the number of speakers to the power supply and more. Sometimes it hard to choose the best one that suits your home. So, before buying the best home theater for your drawing room, here are the few points to keep in mind. How to choose the best home theater systems? Whether you are buying a new home theater or looking for an add-on for existing home theater, you have to keep these points in mind before buying a home theater system. The TV and its Screen Size: Having a better TV for good sound output is necessary. Also, before buying a home entertainment system, do check if your TV supports that system or not. 4K HDR TVs and Smart TVs are best to buy if you are planning to buy one. The big screen always adds extra fun and makes it very easy to lose yourself in the movie. Size of Room: The room size is another factor that you should definitely consider while buying home theater speakers. If you have a big room and you are buying a surround sound system with less sound, you are seriously doing a big mistake. Size of Speakers: Nowadays, compact speakers also provide the best audio. But if you have a big room, do consider a big surround sound system for full entertainment. Streaming Devices: Always choose a home entertainment system which is compatible with your smartphone, tablet, laptop, and your TV. Surround Sound Technology: Do research about the audio technology before buying a home theater system. Technologies like Dolby Atmos, DTS, Sony Dynamic Digital Sound (SDDS) are the best sound technologies. Getting confused in deciding which is the best home theater system to buy? 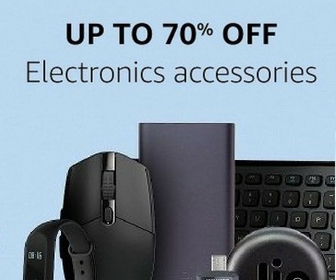 Your money is important and it should be used on the right gadget. Without a doubt, Sony is one of the most trusted brands in electronics but its home theaters are a bit expensive. There are also many other brands which have good and affordable home theaters. The choice is completely yours what to buy or not to. We have done researches and keep in mind about every user’s experiences before making this list of best Home theater systems to buy in the year 2019. You can buy any of them with complete trust. But keep in mind that the current trend is the 5.1 home theater system. This home sound system has 3 sound bars, 2 surround channels, and a subwoofer. So, if you have a good budget for buying a home theater, do buy a 5.1 home theater system. Note: We have also included a few budget Home theater systems that are not as good as the high-end home theater system. But you can select those if you do not want to spend a big amount. This is the list of best Home Theater systems in the Indian market. We have tried listing best Home Theater Systems in every price segment. You can buy any of the best home theater as per your need and budget from this list. Note: Price listed here may vary from online retailers, as they change every day. Sony BDV-N9200W is a Premium Home Cinema System with NFC/Bluetooth & Wi-Fi connectivity options. It is a Blu-Ray Home Theatre System with lighting effect which supports multiple file formats and gives a theatre like an experience. The audio output is 5.1 surround sound at 1200W which produces high-resolution audio. If you can pay more than Rs. 50k for home theater, I will say go for this Sony BDV-N9200W home theatre HT-RT5 5.1. It is one of the best wireless home theater system in the Indian market. Yamaha Yht-2910 – 5.1 Hd Channel Home Theatre System has a stylish and curvy speaker design which looks good in any interior. Its ECO mode operation helps in saving about 20% less power consumption. It delivers powerful surround sound with dynamic bass. This one is also one of the best Best Home Theater Systems to buy in India. 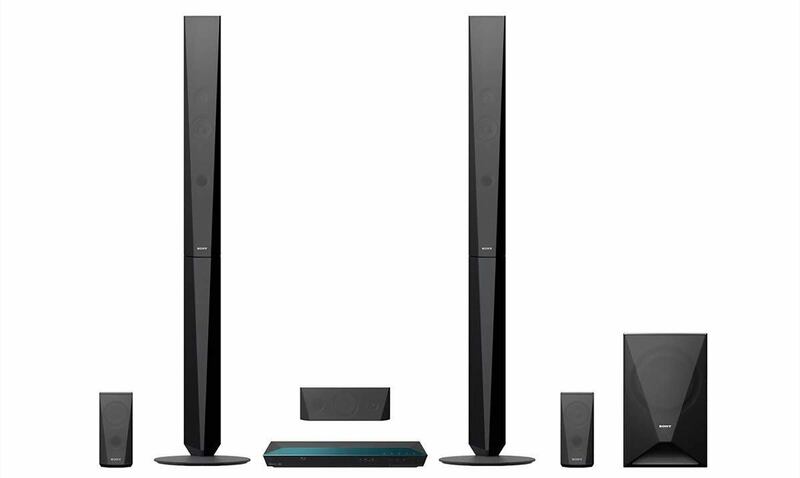 Sony BDV-E4100 Home Theater System gives loud audio experience with its two tall speakers and 1000W output. It has a Football mode which recreates the stadium like experience at home. With connectivity options like NFC, Bluetooth, Wi-Fi, you can easily connect this home theater with your smartphone, laptop, tablet, or connect directly to the Internet. Also, have a look at this list of Best Video Doorbell to keep your home safe from intruders. 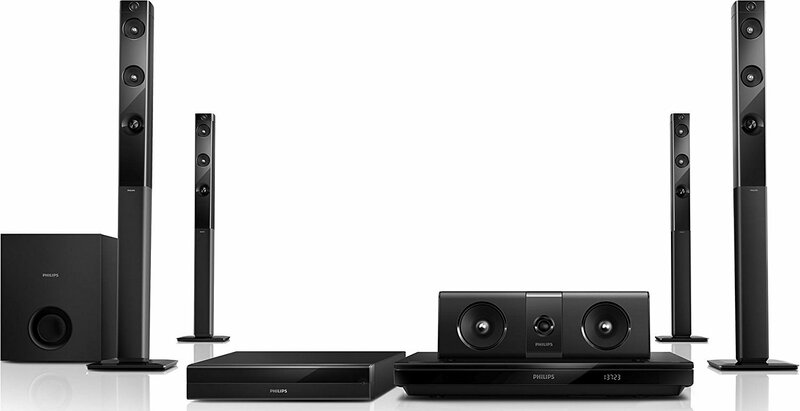 Philips HTB5580/94 1000W 5.1CH 3D Blu-ray has Powerful speakers with double bass pipes for great sound. Dolby TrueHD and DTS-HD Master Audio Essential deliver the finest and clearest sound from your Blu-ray Discs. It has Crystal Clear Sound technique for super clarity and realism. Audio in allows you to connect and play your music directly on your iPod/iPhone/iPad, MP3 player, or laptop via a simple connection to your home cinema. With Built-in WiFi and Bluetooth, you can connect wirelessly to TV and enjoy movies and music. It has one-touch NFC (Near Field Communications) technology which allows you to connect your home theater any NFC enabled device. LG BH6340H 5.1 Channel 3D Blu-Ray Home Theatre System is made of Aramid Fiber material which is highly resistant to the external stimulus. It is applied to the unit to minimize sound distortion and deliver clear and precise sound. It has features like smartphone remote app, sound privacy, SIMPLINK, Mute, A/V sync delay (Audio delay), Dimmer, Sleep, Volume on TV, USB direct recording, External HDD playback, TV sound (direct key), Dynamic range control and more. Samsung HT-J5100K/XL 5.1 Channel is the Blu-ray Home Entertainment System that designed to deliver deeper and richer bass. It has unique patented Crystal Amp Pro technology which enhances sound quality through its multi-variable feedback of sound signals. It has user equalizer settings that can be accessed on your main TV display. You can personalize your audio and adjust the levels of each frequency band with the help of this. Sony DAV-DZ350 5.1 Micro Satellite with 5.1 channel sound system, adds deeper bass and richer treble to your music or videos. This home theater is fitted with HDMI port that allows you to connect your home theater to your TV or monitor and enjoy your favorite movies in the theater like sound environment. With the BRAVIA Sync, you can connect it to your smartphone; no need to struggle with different remote controls for your TV and home theater. It has No wifi, No Internet and No aux and RCA. It has wired speakers and optical IN. 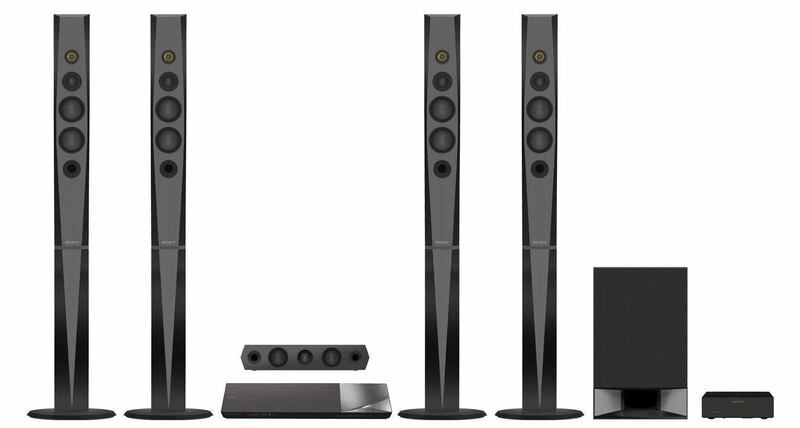 If you are looking for a budget home theatre system, you can buy the Sony DAV-TZ145. Sony DAV-TZ145 offers a complete multimedia experience with its effective video feature and powerful sound. It packs 360 Watt RMS speaker that produces high-quality audio and also has a subwoofer with the output of 60 watts which facilitates enhanced bass. It also has cutting-edge sound technology that provides theatre like audio at your home. It also has Dolby Digital to enhance audio quality. It also features HDMI that enables you to watch HD quality videos. If you cannot buy the high-end home theater system, you should look at this Philips 2.1 speaker system. 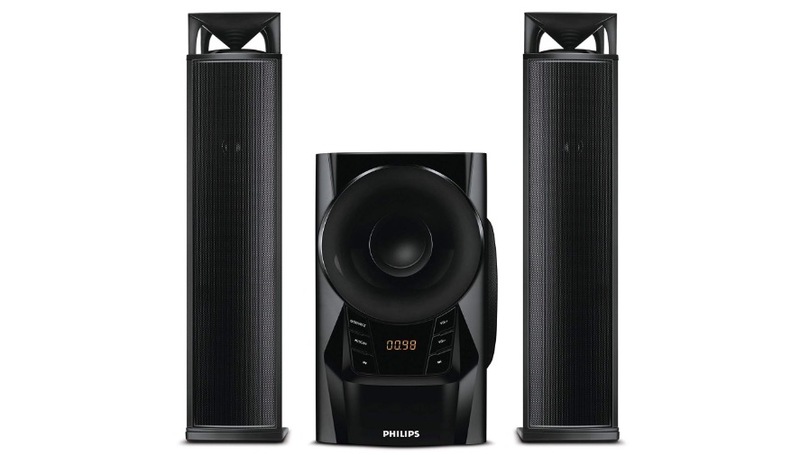 Philips MMS2160B/94 is an excellent speaker system that provides good sound with rich bass experience. It features Bluetooth, SD card and USB Direct music playback. It has 1 central woofer system with 3W of power along with 2 speakers with 15W power each. It also supports FM radio out of the box. It is not much big in size and can easily fit at a desk. It offers rich bass and good sound experience for the price it comes. So, it is a value for money home theater system. This is a 5.1 system from F&D. So, you can arrange it in a way to have a good theater-like experience at your home. It comes with 5 speakers with 1-W of power output (30W RMS). These speakers have 3-inch full range driver. It also comes with a 5.25-inch Subwoofer for proper bass. The bass unit also has a colored LED for offering a party like experience. It features Bluetooth, USB and SD card reader for playing the songs. It also has RM radio where you can store up to 100 different stations. It comes with remote control, to control the music playback remotely. The speaker system performs really well. If you do not have a big budget for a home theater system, you can buy the F&D F3800X 5.1 Speaker and get a decent home theater like experience. This is one of the best home theater systems in the budget segment. Worrying about Air pollution?? These best air purifiers help you in keeping your home safe from pollution and germs. These are the 10 best home theater systems to buy in the year 2019. We hope that your search will end here and in a few days, your home will become the perfect home theater for you. If you know about some other good home theater systems that we missed in this list, do tell us. We will do research and upgrade this list with credit.